625 North Michigan Avenue is a 25 story tower located in downtown Chicago. It was constructed in 1970 and has approximately 350,000 square feet of conditioned space, mainly in the form of retail space and open-plan offices. The tower structure consists of exterior concrete frame, interior columns, interior structural core, and concrete slab floors. The exterior fenestration formed by 2,300 windows with the total area of 58,650 ft2 occupies 41% of the total facade surface area. The building had previously been retro-commissioned to perform to higher energy efficiency standards. The building had already undergone a retro-commissioning exercise that addressed heating, lighting, and building envelope improvements with solar window film. In July 2013, Thermolite was brought in to install interior supplemental windows to demonstrate the effect of its products on an already retrofitted, energy efficient building. The supplemental windows were mounted within the perimeter of the existing frame on the interior of the existing windows of the west-facing offices on the 20th floor of the building. Window 3: 1/4 in. laminated glass with low-e hard coating (interior side) and 1 in. blinds in the air cavity. After the installation of the three interior window retrofit systems by Thermolite, the windows were monitored for three weeks to measure their energy and sound reduction performance. Although 625 N. Michigan was already retrofitted for superior energy efficiency compared to its counterparts, the temperature control findings were immediately apparent after Thermolite’s retrofits were added. Temperature fluctuation was reduced to approximate set points of 68°F and 76°F (10°F difference) compared to the previous range of between 63°F and 92°F (29°F difference). The installation of supplemental windows in 625 North Michigan affects the heat transfer processes through the building’s envelope and their contribution to heat gains and losses in perimeter thermal zones. Thermolite’s interior curtain wall retrofit window system was effective because it greatly reduces thermal conduction through glazing (due to higher R-value), direct solar radiation transmission through glazing into interior space (lower SHGC), and marginally reduce air infiltration. Additionally, acoustical measurements were performed to determine the day-night average sound pressure levels generated by street noise in two separate rooms. 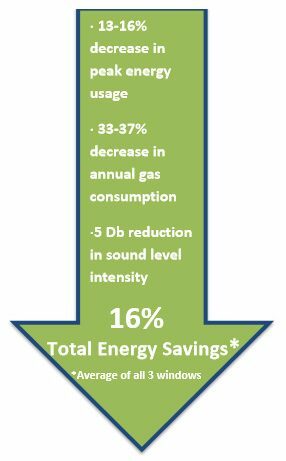 The results found that the room that had windows that were retrofitted with Thermolite supplemental glazing had a sound intensity level 44 dB, which is a 5 dB reduction in comparison with the other room with the original glazing (49 dB level). This change in sound intensity is clearly noticeable by a human ear. It has also been tested to achieve a sound transmission class (STC) of 43 and Outdoor-indoor sound transmission class (OITC) of 33.